Hey y’all Amber here! I don’t know about you but I seem to have so many new babies to go shopping for right now! Instead of going the traditional route and picking something off of a registry why don’t you try your hand at making a simple laminated pocket bib that you know will be appreciated and used over and over! Or if you are a first time mommy-to-be, Congratulations! Coming from a mom of two beautiful children I know if I have used my laminated bibs more than any other gift I received! Think about it by the time your little one has graduated to solid foods we are talking three meals a day and snacks in-between. Phew! Life can get messy! Trust me these guys can be a life saver not only by keeping all those adorable clothes nice and clean but that means less laundry for you! 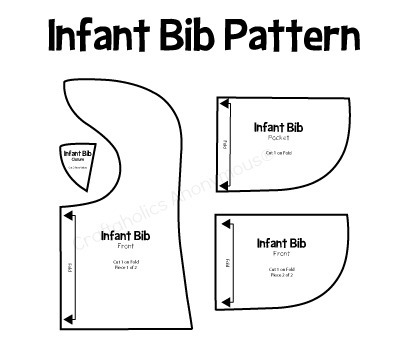 Download Infant Bib Pattern here. 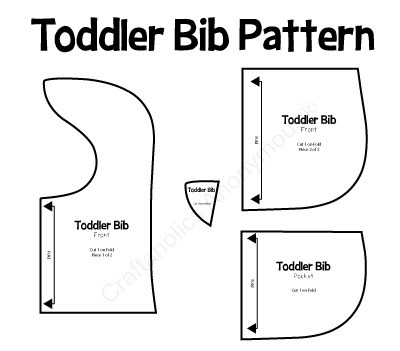 Download Toddler Bib Pattern here. 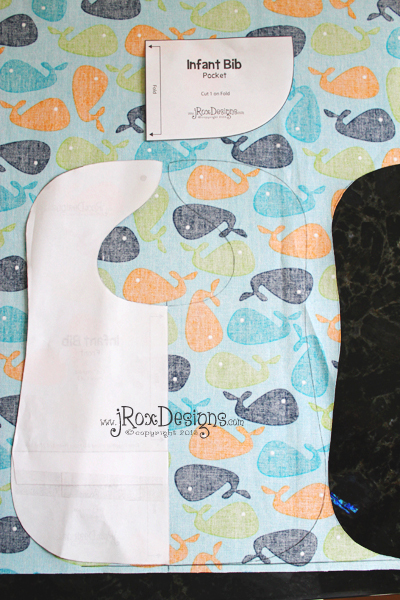 After you have cut our your pocket bib pattern you will need to cut out your bib font and pocket from your fabric. 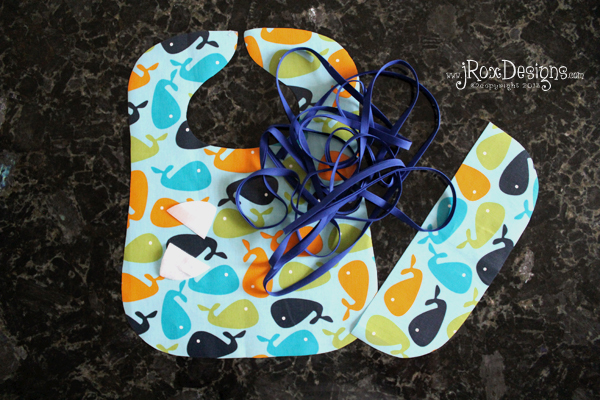 For this project I chose to use a laminated cotton because they are so easy to wipe right up after messy eaters! 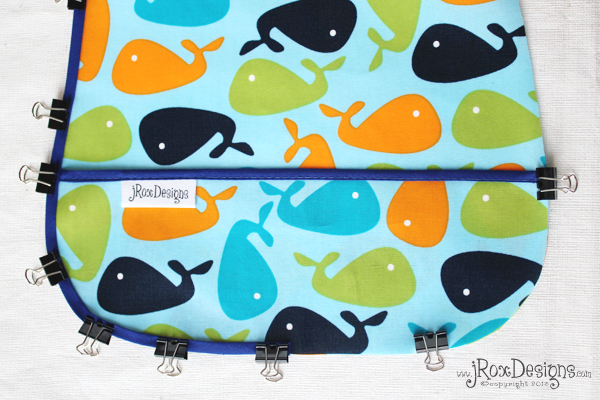 You can also use this pattern with super soft cotton for a droller bib without the pocket if you would like too! One of the only drawbacks of using laminated fabrics is they tend to crease easily. So you will notice in the pattern that it indicates to place your pattern on a fold to cut. Rather than folding my laminated cotton I trace the first side around all the sides except the fold line. Instead of tracing the fold line I make to small vertical tick marks on the top and bottom of the center line and then flip the pattern over onto the back to complete the pattern. Or if you would like you can print off two of each pattern and tape the pieces together to make full size pattern pieces of the front and pocket pieces! With this pattern you can choose from any type of top closure that you would like. You can make a Velcro closure, like I will show you here, or you can use a snap or even extend your bias tape at the ends to make a tie closure. It’s up to you! I love options! If you are choosing a Velcro closure I would suggest cutting and gluing your Velcro first. Then while you are working on the pocket it will give you time for the glue to dry. Since you are only sewing around two out of the three sides of the Velcro I would highly suggest permanently adhearing the velcro to the fabric. Velcro actually makes an adheasive glue specifically for their products that you can find at almost any local craft store. Remember, you want to say away from using anything that requires heat for bonding because it can melt the laminate coating of your fabric. We will start off by sewing the pocket by placing the bias tape across the top flat edge of your pocket. Leave a small amount at the starting edge of your pocket sew straight across with a long top stitich. When you come to the end of your pocket don’t forget to back stitich and then trip any excess off of each end. With laminate and oilcloth the fabric is a bit thicker and I have found over time that when I use pins to hold the tape in place it tends to bunch up the fabric so that it doesn’t sit flat. Then one day after looking around on my desk it hit me….binder clips! They clip your fabric right in place nice and tight, they don’t bunch up or leave holes behind. They are quick to take on and quick to take off! Just like regular pins make sure to slowly take them out one by one as you sew along. One quick line of top stitching and your pocket is done! So far so easy right? Next line up your pocket with the main bib piece and clip in place. I like to start and stop by bias tape on the bottom of the pocket. If you would like to hide it in a better place start your bias tape on top of the loop side of your closure and then it will be covered when the bib is closed. 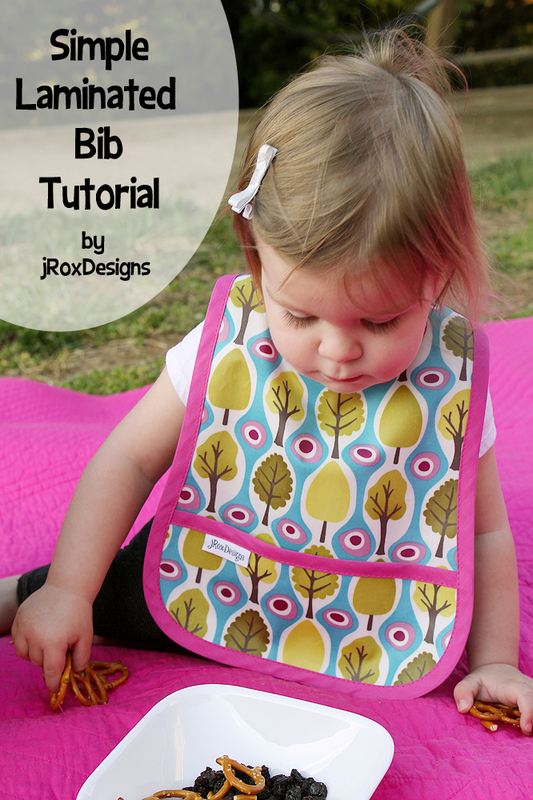 I like to do it on the bottom of the bib because it can get a bit tricky to start and stop around sharp corners. If you take a couple extra minutes you can fold your tape over on top of itself without having to sew the ends together and it can still look really nice. When you are top stitching make sure to reinforce the edge where the pocket meets the bib front by backstitching. This will insure that it can stand up to lots of use over the years! The trickiest part of this entire project is sewing around the inside of the neck because the curves are so tight. 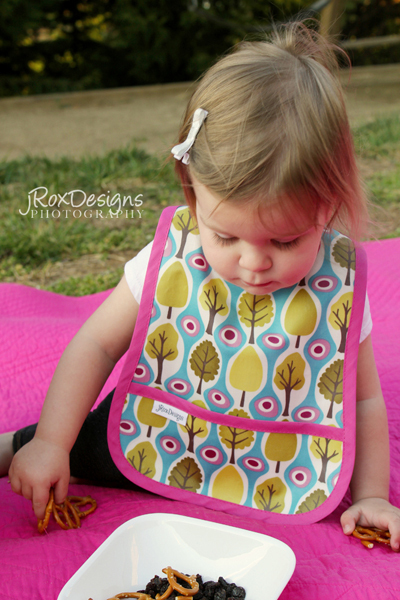 I like a bib that is a bit snugger around the neck so that it saves any dribbles from going behind the bib and getting all over your little ones cute clothes. Again just slow down and take your time and it will pay off. When I make my bibs I usually do one stitch at a time and slowly turn in between each stitch to make sure I’m staying as close to the edge of the tape as possible. If you don’t get it right the first time…it’s okay! Just go back and try again! You can do it! 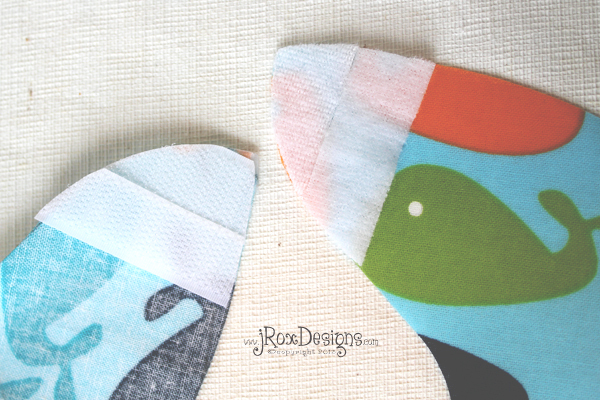 Simply add your Velcro and go straight to sewing on your bias tape! Forget about cutting those Velcro pieces and use the dot at the top of your pattern as a guide as to where to place your snap! Print off the original patterns for this project and add in your preferred seam allowance around the outside of the entire main front piece. Cut out two pieces of fabric one for the front and one for the back. 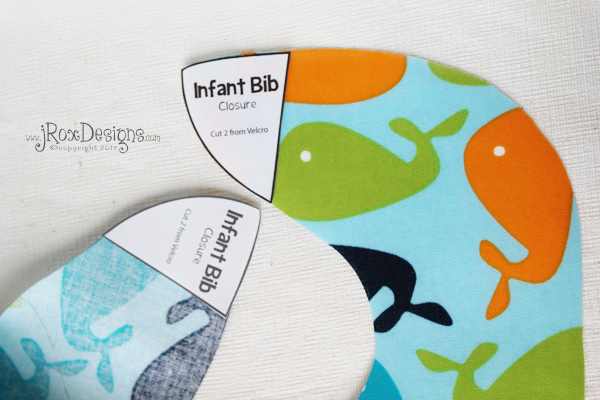 Place the two fronts together and begin sewing them together using the seam allowance you chose at the bottom center of your bib. 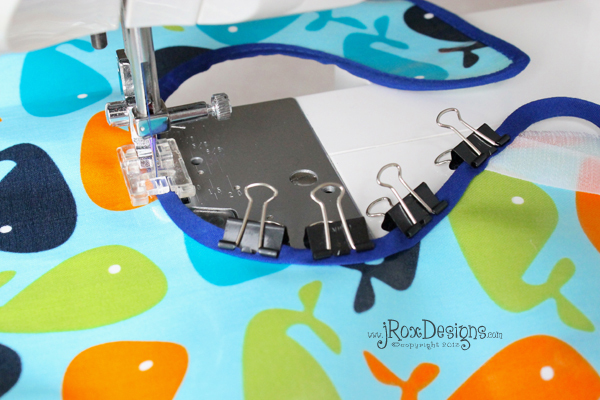 Sew all the way around your piece leaving a small hole to turn your fabric right side out. Turn and press. Topstitch around the entire bib. Then choose your closure to finish it off! Don’t have time to sew? 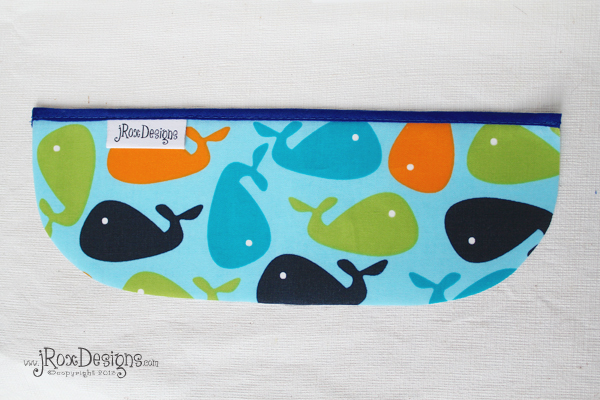 Check out finished custom bibs in my Etsy shop here! Looking for a fun way to announce a pregnancy? Click here for a free pregnancy reveal printable! So cute and such a good idea. Thanks for the tutorial! Where can I buy cute laminated fabric? The cloth shown is super cute! Thanks for sharing this cute pattern idea with us and what a great idea on pinning your binding would of never thought of that :). Thanks for sharing God Bless. 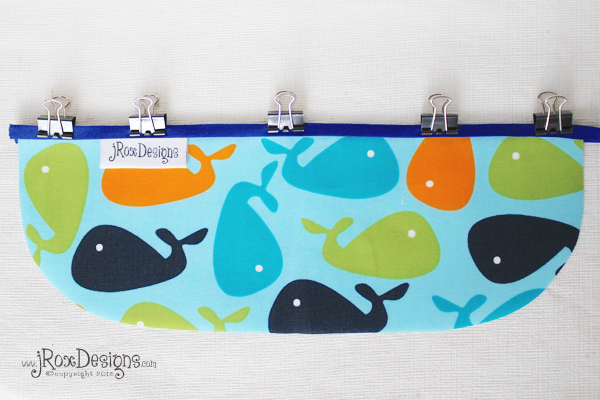 Laminated and oilcloth fabrics can be tough to find! I found some of the smaller locally owned fabric shops in my area sell them. I buy most of mine at a local shop called Elegant Stitches who also have an online store that offers some of their fabrics too (http://www.elegantstitches.com). There are also a couple Etsy shops that have a fabulous selection (https://www.etsy.com/shop/Laminates and https://www.etsy.com/shop/oilclothaddict) Another one of my favorite go to stores is http://www.fabric.com! Good luck with your search! 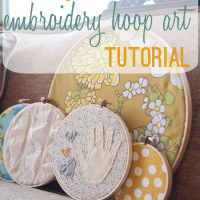 Wonderful tutorial and pattern. I love the idea of using oilcloth. I’ll be pinning this to my sewing board. Where do you find laminated/oil cloth fabric. I’ve had a hard time finding good, modern patterns. I have some in Riley Blake Yellow Panda Laminate in stock as well as chalk cloth in my Etsy Store. So cute, and great pattern! Thanks for the greet pattern. With new twin grand babies I will be making lots of bibs. I have been looking all over for this fabric and have found it but they only sell it in 18×20 and it wont fit 2 bibs. Where could i purchase this for a decent price in cuts of 18×22. Hey Paige – The widest part of both of the bibs is actually only 9.5″ wide. So ideally you could probably be able to still get two bibs out of a 18×20″ piece if your piece is truly 20″ wide and was cut straight. I recommended a 18×11″ piece for one bib just to make sure that you had enough wiggle room in case the piece wasn’t perfectly square and that you had enough extra around the edges to work with. I think if you are careful and you make sure that the piece you are ordering is actually 20″ wide you should be okay! Come back and share pictures when you are done. We would love to see them! Thank you so much Amber. I will be back to share photos when i have a finished product! I got away with getting .25 metre of laminated fabric that was on sale (so hard to sew on a tight budget!) and the pattern width fit perfectly. Your bib is very cute! I just started using the clips from Clover and they are great! You can get the binding close to the curves. Two questions for you: what kind of foot do you use on your sewing machine and where do you get your labels made? Thanks for your help. Those Clover clips look really neat! I’ll have to try them sometime. The foot that you see in the photos is a Satin Stitch Foot. I’m sure there is probably a better foot to use but I always love them because you can see underneath the presser foot to make sure everything is still lined up okay, just a personal preference! The labels I have been I bought a couple years back and unfortunately the company is no longer in business. I’m on the look out too for a new company to use. I’ll let you know when I find one! Thanks for stopping by! Pingback: Craftaholics Anonymous® | Free Bib Pattern for all Skill Levels! 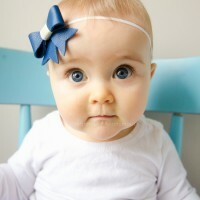 Have you ever used the PUL fabric by Babyville Boutique? Wow! This could be a very great thing to do especially for mothers that loves to make things by their own for baby. Thank you for the pattern. I need to make some of these for my 95 yer old mother. What size/type needle do you use on your machine? I have a dumb question. How do I get the printer to print the patterns out actual size? I can’t seem to make it do that. 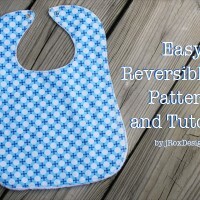 I love this pattern and have made several bibs using it You can see them on my website kathysthreads.wordpress.com. I pinned your fantastic tutorial and pattern to my Pinterest Board. You won’t believe how many people have repinned it! It seems I get an email every day telling someone has repinned the pin and that’s not including the people who may go directly to your site and pin the bib from there. You have designed a wonderful pattern and written more than excellent instructions! I am completely in LOVE with the tree fabric pictured above! Please share where I can find this!! Why are there two front pattern pieces? -The main one has a squared corner and the other a round one?